North America, New Zealand and Australia were colonised by England under an international legal principle that is known today as the doctrine of discovery. This book analyses how England applied this doctrine to gain control over the lands, property, government, and human rights ... read full description below. 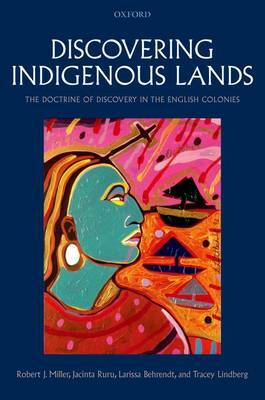 This book presents new material and shines fresh light on the under-explored historical and legal evidence about the use of the doctrine of discovery in Australia, Canada, New Zealand and the United States. North America, New Zealand and Australia were colonised by England under an international legal principle that is known today as the doctrine of discovery. When Europeans set out to explore and exploit new lands in the fifteenth through to the twentieth centuries, they justified their sovereign and property claims over these territories and the indigenous peoples with the discovery doctrine. This legal principle was justified by religious and ethnocentric ideas of European and Christian superiority over the other cultures, religions, and races of the world. The doctrine provided that newly-arrived Europeans automatically acquired property rights in the lands of indigenous peoples and gained political and commercial rights over the inhabitants. The English colonial governments and colonists in North America, New Zealand and Australia all utilised this doctrine, and still use it today to assert legal rights to indigenous lands and to assert control over indigenous peoples. Written by indigenous legal academics - an American Indian from the Eastern Shawnee Tribe, a New Zealand Maori (Ngati Rawkawa and Ngai Te Rangi), an Indigenous Australian, and a Cree (Neheyiwak) in the country now known as Canada, Discovering Indigenous Lands provides a unique insight into the insidious historical and contemporary application of the doctrine of discovery. Robert J. Miller is a professor at Lewis & Clark Law School in Portland, Oregon, where he teaches Indian law courses and other classes. He is the chief justice of the Court of Appeals for the Grand Ronde Tribe and sits as a judge for other tribes, and is a citizen of the Eastern Shawnee Tribe of Oklahoma. He won the Woodcraft Circle of Native Writers Award for Writer of the Year, Non Fiction, 2006-07. Jacinta Ruru (Ngai Raukawa, Ngai Te Rangi and Pakeha) is a senior law lecturer at the University of Otago where she teaches and researches Indigenous peoples' rights to land and natural resources. She has been the recipient of several awards including: the University of Otago Early Career Award for Distinction in Research (2006); the New Zealand Federation of Graduate Women Harriette Jenkins Award (2003); the Inaugural National Maori Academic Excellence Award for Law in recognition of her LLM thesis (2002); and a New Zealand Fulbright Travel Award (2002). Larissa Behrendt is the Professor of Law and Director of Research at the Jumbunna Indigenous House of Learning at the University of Technology, Sydney and a practicing barrister. Larissa is a Land Commissioner at the Land and Environment Court and the Alternate Chair of the Serious Offenders Review Board. She is also NAIDOC Aboriginal Person of the Year in 2009 and has been awarded the Commonwealth Writer's Prize for South East Asia and the Pacific Best First Novel (2005), the David Uniapon Award for unpublished manuscript (2002), the Neville Bonner Teacher of the Year Award (2002) and a Federation Medal (2001). Tracey Lindberg is Professor of Law at the University of Ottawa and Athabasca University in Canada and is a member of the Indigenous Bar Association and the Saskatchewan Bar. Dr. Lindberg teaches Advanced Aboriginal law, Indigenous legal theory, Aboriginal women's legal advocacy and the Historic Roots of Contemporary Legal Issues in Indigenous Nations. She has won the Social Sciences and Humanities Research Council Doctoral Award, The University of Ottawa's Governor General's Gold Medal in the Social Sciences for the highest academic standing in the Faculty of Graduate Studies at the University of Ottawa, and the Canadian Association of Graduate Studies / University Microfilms International Award for Distinguished Dissertation in Canada for her dissertation, Critical Indigenous Legal Theory.